Plenty of parking in our spacious lot! Loccino's features private banquet rooms as well as a semi-private dining room. We are dedicated to providing everything necessary to make your special event easy and worry free. Choose from our popular family-style dining options, one of our plated menu options, or buffet style dining. Loccino's Italian Grill and Bar offers authentic and unique Italian cuisine. Dine at Loccino's for a delicious, relaxing experience. We pride ourselves on our warm, friendly atmosphere, impeccable service and fine food. Look for a wide selection of fresh seafood, steak, chicken and veal, traditional as well as unique pasta dishes, chicken picatta, Parmesans, numerous salads and much more. Enjoy Loccino's for lunch, dinner, dessert, drinks, banquets, happy hour, events and catering. We also have two private banquet room, contact us to book your next private party! Gluten free side pasta with entree add $1.50, Gluten free pasta entree add $3. Ask your server for more choices. Tossed with sautéed kalamata olives, roasted red peppers and basil with fresh garlic served over marinara sauce. Jumbo shrimp coated with italian bread crumbs and tossed with chef's guesepi sauce. Topped with shrimp, crab, spinach and lemon wine sauce, baked with provolone. Served with loccino's own marinara sauce. Sliced fresh mozzarella and tomatoes served with extra virgin olive oil and fresh basil. Pan-seared with zip sauce, banana peppers and mushrooms. Grilled chicken add $3, Shrimp add $3.50, Salmon add $4. Any salad chopped add $1 More. Crisp mixed greens with tomatoes, onions, cucumbers and croutons. Tomatoes, gorgonzola cheese, bacon, eggs and balsamic vinaigrette dressing. 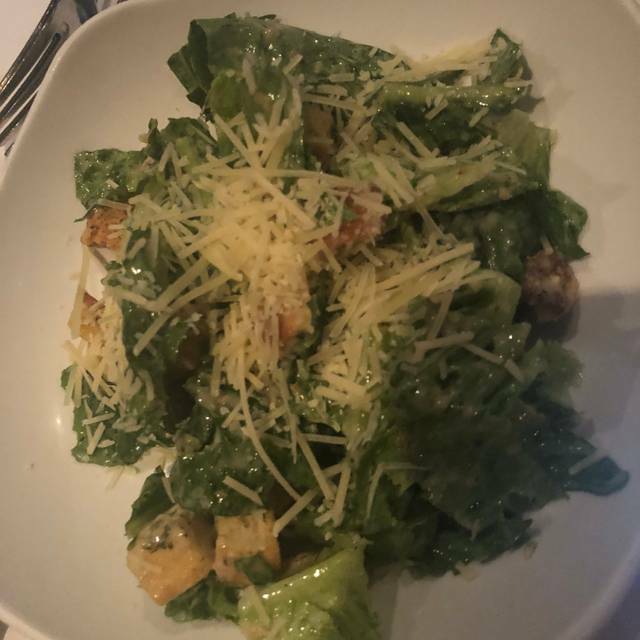 Crisp romaine lettuce, croutons, parmesan cheese and our house-made caesar dressing. Crisp mixed greens, feta cheese, kalamata olives, tomatoes, cucumbers, mushrooms, beets, onions and our house-made italian dressing. Penne noodles, mozzarella, broccoli, tomatoes, onions, cucumbers, black olives and dill tossed with our own housemade italian dressing. Tomatoes, gorgonzola cheese and roasted almonds with balsamic vinaigrette dressing. Greek salad plus salami and provolone. Grilled salmon, spring mix with roasted almonds, gorgonzola cheese and dried cranberries with raspberry vinaigrette. Three beer-battered jumbo shrimp, romaine lettuce, red onions, tomatoes, crispy red skin potatoes and house-made italian dressing with a touch of ranch. Grilled chicken breast, avocado, gorgonzola cheese, tomatoes, eggs and lettuce in our house-made italian dressing and a touch of ranch. Seared cajun filet over romaine with avocado, tomatoes, crumbled blue cheese and cucumber served with balsamic vinaigrette dressing. Fully dressed and served on a hand crafted artisan roll. Stacked turkey, ham, bacon and mayo. Bbq chicken breast with melted provolone topped with house made onion rings served on an onion roll with french fries. Pan-seared beef tenderloin with grilled mushrooms, onions, melted provolone cheese and served on a hand crafted artisan roll. Served on house-made bread with sauteed mushrooms and onions. Fresh marinated variety of vegetables, grilled and baked with mozzarella, pesto mayonnaise and served on a hand crafted artisan roll. Filet of salmon dusted with cajun spices, char-grilled and served on an onion roll with pesto mayonnaise. All entrées in this column, excluding pizza, include a field green salad with house-made italian dressing. Any salad chopped add $1. Add meatball, mushroom, italian sausage or melted cheese for $2 Each. Spaghetti topped with our own meat sauce. Stacked high with tender pasta, mozzarella, herbs and our own bolognese sauce. Cheese-stuffed tortellini noodles in creamy tomato sauce topped with grilled chicken. Imported rigatoni in a chunky tomato-spinach olive oil sauce topped with grilled chicken and baked with mozzarella cheese. Shrimp, scallops and mussels with spinach, diced tomatoes and light lemon cream sauce tossed with linguine. Grilled chicken accompanied with portabella mushrooms and sun-dried tomatoes, all tossed in our creamy pesto sauce over penne pasta. 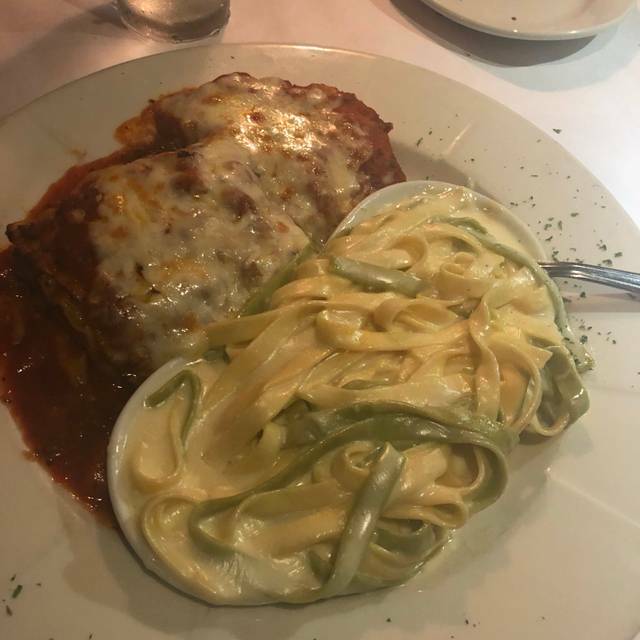 All italian favorites served with a side of pasta. Breaded eggplant, marinara sauce and four cheeses. 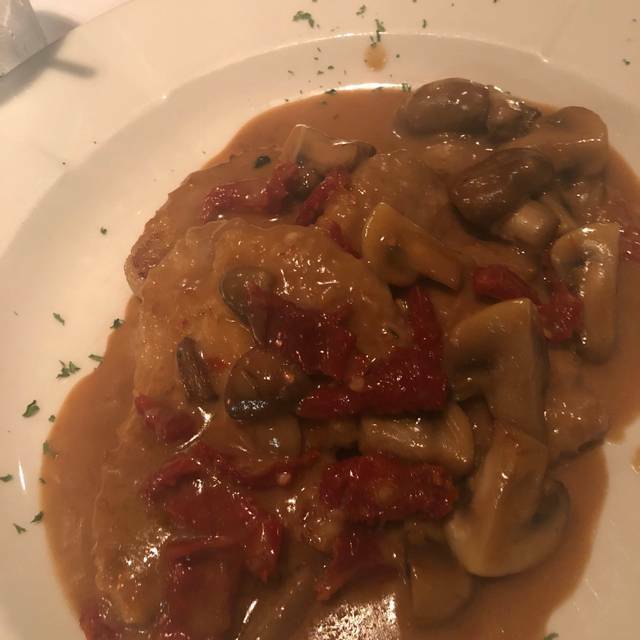 Veal medallions sautéed with mushrooms and sun-dried tomatoes in a marsala wine cream sauce. Sautéed chicken with capers and mushrooms in lemon wine sauce. Sautéed breaded chicken topped with marinara sauce and baked cheese. All of the above served with vegetable of the day. Fresh sautéed perch served over garlic mashed potatoes topped with lemon wine cream sauce and capers. Shrimp dipped in a beer-batter and fried to perfection. Served with french fries. Fresh fi let of salmon broiled with marinated plum tomatoes and red onions in olive oil with fresh garlic, basil and balsamic vinegar. Breaded fi lets of tilapia pan-fried and topped with artichokes and sun-dried tomatoes in a chablis lemon wine sauce. Great Lakes filet of whitefish broiled with white wine, lemon and Italian seasoning. Filet mignon over garlic mashed potatoes and zip sauce. Grilled and topped with sun-dried tomato and portabella mushroom in a marsala cream sauce served over garlic mashed potatoes. Ny strip steak served with zip sauce and garlic mashed potatoes. Sliced tomatoes, basil, mozzarella cheese and olive oil. Garlic, portabella mushrooms, spinach and mozzarella. Tomatoes, mushrooms, black olives and mozzarella. Creamy pesto, grilled chicken, artichokes, sun-dried tomatoes and mozzarella. Loccino's is very consistent. You can go there multiple times and always have a very good experience. They are a 5 star for value because the quality and preparation of their food rivals the high end restaurants, but at a moderate price point. Their servers are well trained - Not disruptive and overbearing, but always seem to show up at the right time with the right questions and answers. We had appetizer, salads and entrees. Timing of the food was perfect. We enjoyed the booth for well over an hour, enjoyed our espresso and coffee. This is a restaurant you go to to have great conversation, a relaxed atmosphere and a memorable food experience. This was our first time here and we enjoyed it thoroughly! The salmon with sherry cream sauce was so good and my husband loved the veal Marsala. We will definitely go back. Very nice place to enjoy the company with our friends and prices are reasonable for the meals which are very good! We thought prices were fair. We each had an alcoholic beverage, and for an appetizer and entreé with salads, the bill came to around $75. The quality of the food and service was excellent; we would have paid more and were happy to tip well. We will definitely return! Everything was delicious, as usual. The wait staff was very attentive,maybe a bit too much. We did feel a little rushed as everything seemed a little frenetic. Having said that, it wasn’t so bad as to ruin the meal. I really hate to even bring it up, but just letting you about a comment from our party. Certainly won’t stop us from coming back. Love this place. Two of the three of us had the lamb chops. The lamb had a very strong taste and was somewhat fatty. Would not recommend the lamb. So far the only meal I had that was mediocre. Veggies and potatoes were great. 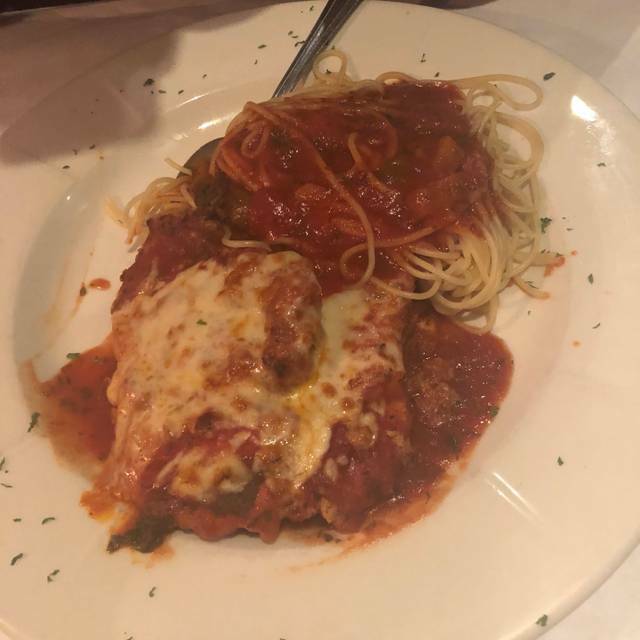 The third in our party had the veal parmesan which was wonderful. Service was exceptional and the ambience is fun, romantic and whatever you want it to be. Need to drop the lamb from the wonderful menu. Regardless, would highly recommend this place to anyone. The rest of the menu is diverse and very tasty. A truly enjoyable meal as always. Attentive, professional staff; great value for the money. We enjoy coming here whenever we have something special to celebrate, but often for no special reason at all. The sea bass is excellent! It was my birthday. Good food. Waiter seemed overwhelmed and distracted so she wasn’t really attentive towards our table. Great service and good food. Only complaint is that they need to update their website menus including the wine menu. Food was great and at a reasonable price. Thank you for bringing ice cream out for my grandma with a candle. She absolutely loved it. She is 94 and has been having health problems and it really made her night. Very nice ambience. Wait staff was very prompt and attentive. Food was excellent. We will be going back again. Great food. Nice place to sit and have conversation over a delicious dinner. Ashley ensured we had a wonderful time. Very happy with the experience! Not high on my recommendations. Food took about an hour to come out, our waitress never returned other than to tell us it would be up shortly, which it wasn’t. Disappointing as this was my first and last time there. Another awesome Italian meal at Locchino's! We love the entrees, especially the home made pastas. Everything is so good here!! Food is delicious. I went a couple weekend ago and went back for the linguine de mare. It’s amazing. We had the eggplant, lasagna, salad, minestrone, beer & wine - all very good to excellent, service was superior in every way. prices were reasonable - 4 1/2 stars - we will return and recommend highly! Had a great time, serve was great and food was delicious. Highly recommend. Always a great experience and meal here. Beautiful restaurant- great food and service. The beef, portabella and cheese ravioli is the best! Black and blue salmon special was awesome, would definitely get it again. Appetizers were very good and our server was awesome. Food was very good. Jamie was a great waitress and provided excellent service! We had an 8:00 reservation on New Year’s Eve. The food and wine were delicious and our server was friendly and efficient. She and the hostess were both willing to take our photos. Although a busy evening for dining, the quiet atmosphere is conducive to conversation. We frequent Loccinos often since they are in our neighborhood. We have always gotten decent service and good food. However, on New Years Eve 2018, the service was not up to par and we had friends with us who never ate here before. Our reservations were honored with no problem but the service was not good. First, it took a very long time to get our drinks (there were six of us). When the drinks did finally come, we were told the waitress walked into someone and spilled them all so they had to be remade. Everyone got their drinks but one wine was missing so she had to go back to get it. Then, my martini glass appeared very very sticky and every time I took a drink and set it down, it stuck to the table, almost as though the drink was remade with the first glass that spilled. 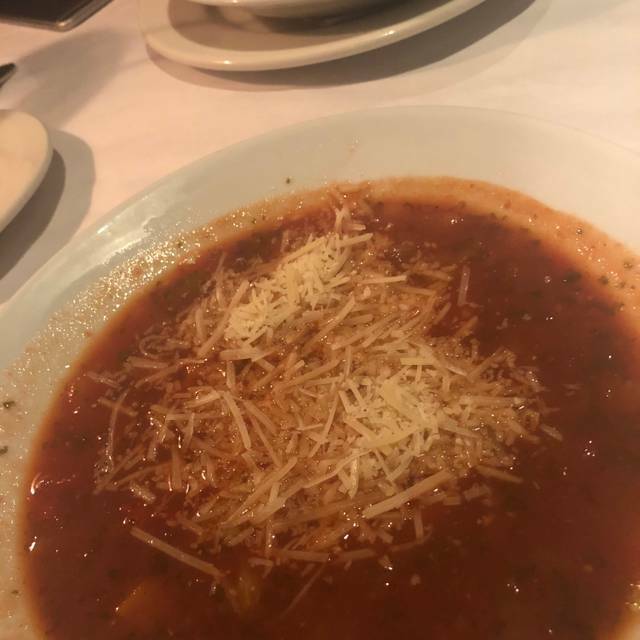 Then it took a very long time to get our salads and soups, and again one soup was missing and the waitress had to go back and get another soup. Then we asked for a refill on bread at least three times before we got it. The rest of the dinner was ok. We will be back (but not on a major holiday again) but not sure if our friends we were trying to impress will be. Food was amazing. Service was excellent. What more could you ask for. We had a wonderful meal on New Year’s Eve and our friends were impressed as well. We all enjoyed our meal and it was nice that we could talk without yelling to each other. We will all return. Great food. One of the few busy restaurants that you can actually talk and hear others that are at the table with you. Recommended for family gatherings, date night or dining with friends. Quite frankly, I went to this restaurant by accident! I had planned to take my nephew to dinner for his birthday and I remembered an Italian restaurant I went to ‘on the east side’ and as it turned out, this was not the restaurant! I made reservations and we went! The place is lovely, service was very good and the food was great! So my accidental ‘find’ was a good one! Food was excellent and it was ready so quickly. Best restaurant experience I’ve had in a while. This establishment never fails to impress. We have been dining here for years and have never had a bad meal. The Breaded steak with Amigo sauce is a must try dish and even though it was not on their holiday menu, they still made the dish for us. I would highly recommend this restaurant even if you have a bit of a drive to get to it. We’ve been here several times and we always love it. 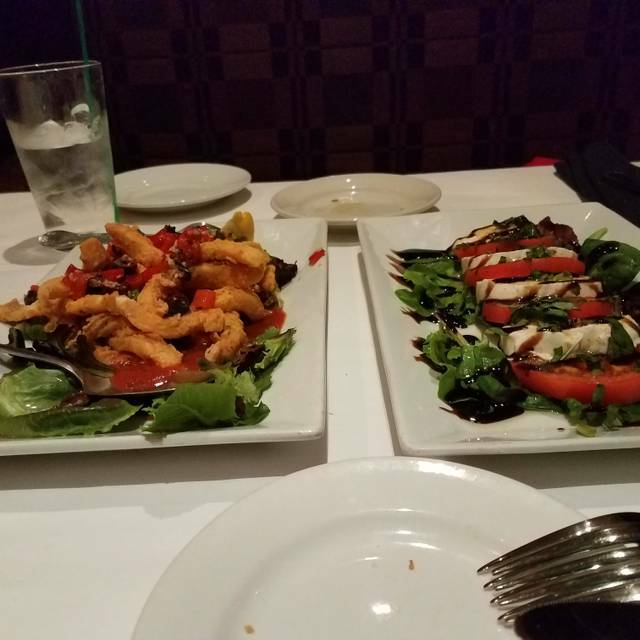 The food is consistently very good, and the calamari is always fantastic. Prices are reasonable, they pour a good drink, and the service is always very good. Can’t say enough good things about this place! Great place for a special event. Delicious Italian food. The Seafood Stuffed Mushroom was delightful. My wife said the Lobster Ravioli was the most delicious she ever tasted. The Lasagna was wonderful. The layout of the seating provided a uniquely private setting within a full restaurant. The only thing that would make it better was a better selection of Italian wines. We’ll be back. Nice ambiance and good food! The Manhattan Clam Chowder was outstanding. Our waiter was a little slow in providing our bill and then returning to check us out. Otherwise, everything was great. I come here often and always enjoy coming here. Dave(Server)was great! Food was fantastic. We Will be back.